In 1982 a partnership was formed between Frank Coviello, owner of D&M Exxon, and David Rush in order to provide auto body repairs to the Exxon’s customers. By offering these affordable services, the auto body department was an instant success and business increased rapidly. We quickly outgrew the one bay available to use in the Exxon building. 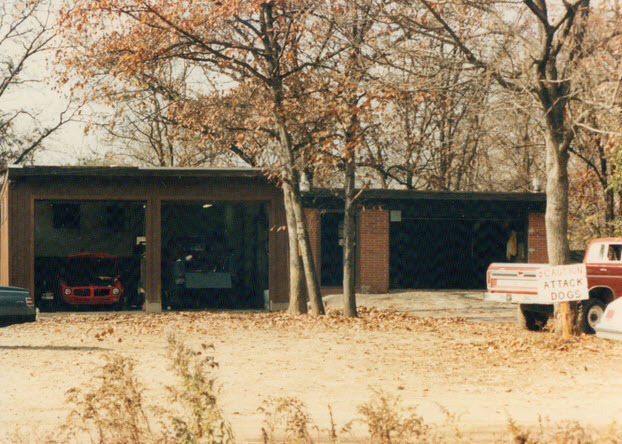 Then in 1984, we moved the auto body repairs to a five-bay shop located only a few blocks away from D&M Exxon. It was at this time that D&M Auto Body officially began as it’s own business, separate from D&M Exxon. With our customer base comprised mostly of D&M Exxon customers, we decided to keep the name: D&M (which are the initials of Frank’s daughters: Diane & Michelle). 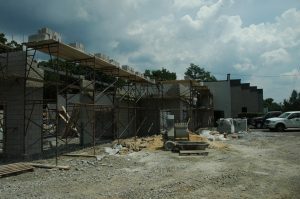 While having a separate building was a great improvement, we were now located at the end Gill Ave. – which came to an end at a dirt road leading to the woods. In addition, a wooden bridge with no side rails, which crossed over a brook (that periodically flooded), had to be crossed in order to get to our shop. 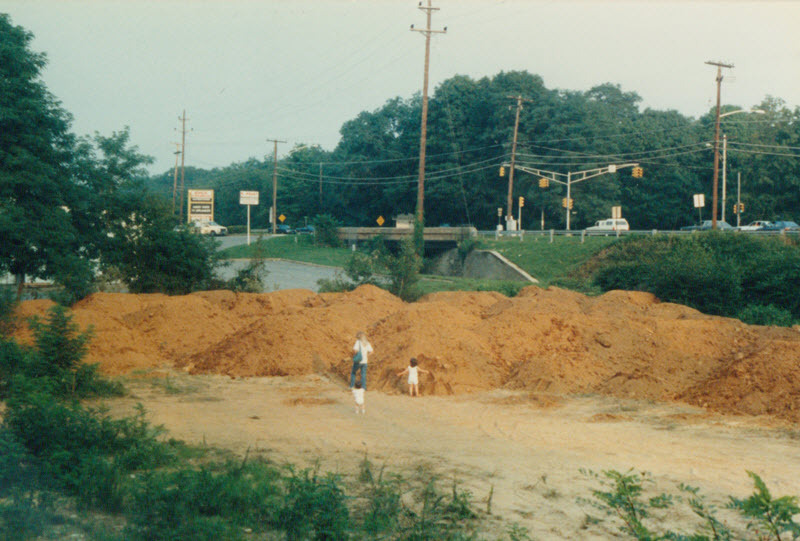 Because of this, many of our customers were afraid to drive over this bridge to get to us; so they actually elected to walk over the bridge instead. In addition to our less than convenient access bridge, a deteriorating old house trailer was being utilized as our office and two large dogs were our security system for the property. However, regardless of our undesirable location and unattractive officer space, the auto body shop continued to grow. This meant it was time for us to make another move. Due to our constant growth, we felt that it was finally time to invest in our own property instead of continuing to rent. 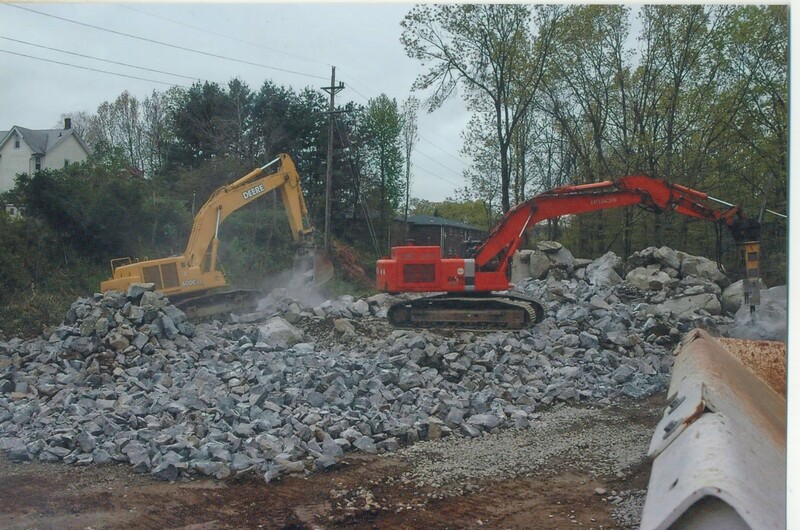 In 1988 we purchased property on Route 46 and East Main Street in Rockaway and designed a state-of-the-art collision repair facility to be built there. Unfortunately, this was the peak of the savings & loan crises and our bank retracted our loan pre-approval. 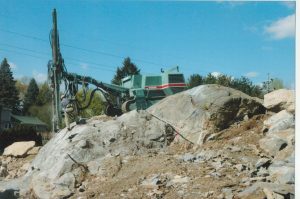 Although the initial site work was completed, the remainder of the project had to be put on hold. 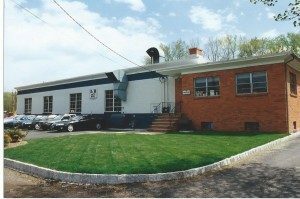 Later that same year we relocated to a 5,000 square foot industrial building that was also on Gill Ave. In addition to now having ten repair bays and an actual office, this move allowed us to install our first down-draft paint booth. The installation of this paint booth improved paint quality and reduced repair time. Our new location also allowed us to begin marketing our more professional operation and we acquired many local car dealers along with a few insurance accounts. This location served us well for several more years, but we kept growing and it was soon time to move again. This time, the circumstances were right for us to build our own building. 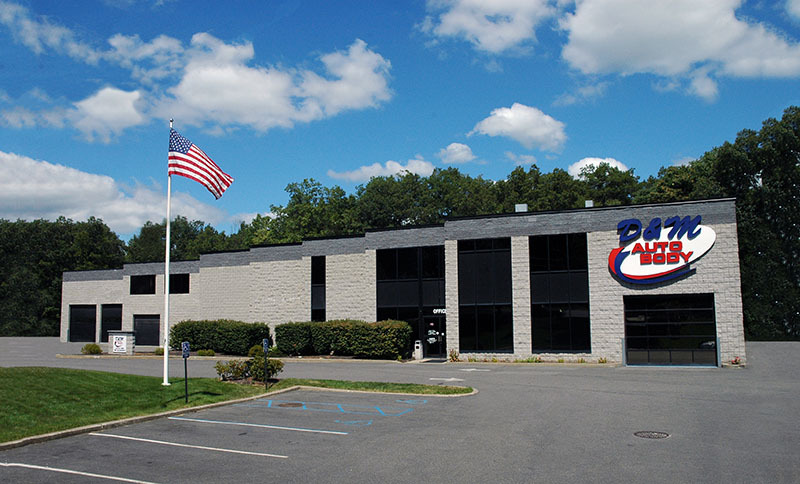 In 1996 we finally constructed our modern, state-of-the-art collision repair facility on our Route 46 property, originally planned in 1988. This new facility enabled us to provide an even higher level of customer service, repairs, and had a very convenient location. In addition to location, D&M Auto Body now had a customer-friendly office with a comfortable waiting area, an indoor estimating bay and eighteen repair bays. New major equipment included two efficient down-draft paint booths, and three frame machines with computer measuring. 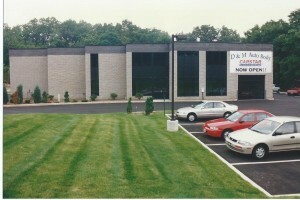 D&M Auto Body kept growing and, within a few years, we were working at maximum capacity in our facility. In 2004, we acquired additional property that was located along the rear of our existing shop and we began planning a large addition. After almost six years, we finally acquired all of the necessary approvals and permits. In 2011 we began construction – which included four months of blasting to remove a large amount of rock that divided our property in half. In late 2012, construction was completed! The addition doubled the size of our shop and gave us the needed room to streamline our repair processes. With the extra room, we were able to create an assembly-line type repair facility. This type of layout made it possible for us to complete repairs more efficiently, so our customers could get their vehicles back quicker. Other major improvements incorporated with the addition included: an indoor inspection/detail area, parts department, and a total of 30 repair bays. With these improvements and the quality of repairs, it allowed D&M Auto Body to become a certified collision repair shop for many popular vehicle manufacturers. Since 1982, we have found that making the customer our number one priority is the key to being successful. Therefore, our goal is to continue repairing collision-damaged vehicles to the highest possible standards, while keeping our customer’s best interests in mind. Many of our employees have been with our company throughout our success, and we are all committed to our business philosophy. From our humble beginnings as a single bay in a mechanical shop, we are proud D&M Auto Body has been able to grow into one of the area’s most respectable collision repair facilities. D&M Auto Body’s mission is to perform the highest level of ethical and quality auto collision repairs while maximizing customer and shareholder value; to support and improve our community; and to provide a safe and rewarding work environment for all employees. D&M Auto Body strives to be the preeminent provider of auto collision repair by offering customized repair solutions, that deliver maximum value for our customers insurance or out of pocket dollar. Meeting or exceeding our customer’s expectations is our primary goal. This is achieved by providing our services with exceptional customer service while meeting both our customer’s quality and financial repair needs, while minimizing the amount of time they are without their vehicle. D&M Auto Body has created and maintains an organizational culture that attracts and retains intelligent and talented employees who have been empowered at every level to consistently deliver our company’s core values, which is proven with long-term employees and the company’s 30 plus year history of solid performance. To continue long- term success for our organization and our employees as individuals, D&M Auto Body offers learning and career opportunities within a stimulating environment that in turn improves our employee’s and their family’s quality of life. D&M Auto Body continually works on maintaining our position as a leading organization in the collision repair industry by means of recognition within and outside the company. To be a trusted, ethical and profitable provider of safe, quality collision repairs that provides exceptional value to our customers. Establish lasting relationships with our customers by exceeding their expectations and gaining their trust and repeat business through exceptional service. Guarantee our customers receive the best possible repair for their money while protecting their safety and the value of their vehicles. Maximize shareholder value while maintaining a safe and stimulating work environment for all employees. Be an organization that focuses on improving the quality of life of our employees and their family’s through beneficial and stable long-term careers. Serves and supports our community through sponsorships for local organizations, local youth sports and scholastic club projects and activities. To be a leading organization on a local, state and national level devoted to continually improve the professionalism of the auto collision repair industry. Excellent service, communication and great work. Bob the GM is very professional. Highly recommended. The shop does superior work. They treat you well and make it all very simple the whole way through the process. I stopped in without an appointment to get a quote on some minor damage to my brand new car and Nicky took the time to not only clean off the scratches and scuffs, but she showed me how to apply my touch up paint properly - almost completely fixing the damage for me on the spot. I hope not to have to, but if needed I will absolutely use / recommend D&M. Nicky went above and beyond and I greatly appreciate it. 100% recommend D&M Auto Body. Very satisfied with the many projects for commercial and personal vehicles D&M have completed. D&M quotes are realistic and quality work is performed. From the general manager to the technicians, everyone is very professional. Verry satisfied with the work they did on my nissan sentra 2016. I don’t normally write reviews but they handled everything smoothly and fast. I dropped of my car Monday and got it back Thursday. Although I waited over a month to get my car fixed, it was definitely a worth it wait. This place is amazing. They did a lot for my card but were very very fair with the price, trying to help me and really looking after my budget. The staff was so friendly and helpful, I had the most amazing experience with this auto body shop, and I would highly recommend it to anyone looking for an honest and awesome job!! !